Swapcrop is the latest in a series of initiatives encouraging us all to be more community minded and gain something in the process. (Other examples being Landshare and Freecycle). 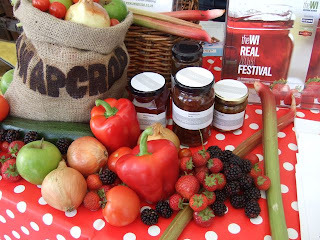 The basic idea is that people who grow more veg or fruit than they know what to do with should make it available to keen jam and chutney-makers who don’t have a garden or allotment in return for a few jars. 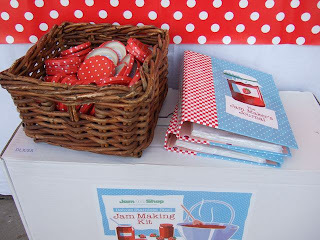 The idea comes from the newly formed Guild of Jam and Preserve Makers whose mission is to ‘promote and encourage jam and preserve making' and to provide a forum for jam makers to swop tips. It’s been set up by Rosemary Jameson, founder of the incredibly useful Jam Jar Shop which provides all kinds of jam-making supplies. Pam Corbin who wrote the excellent River Cottage handbook on Preserves is the president. Seems like there’s a bit of a jam revival going on at the moment. The WI is holding its first Real Jam Festival at Denman College in Oxfordshire from the 20th-21st of November which sounds like a good old-fashioned village fête with competitions, demonstrations, fresh produce stalls and ‘refreshments’ (when did you last hear that word?). I like some of the tongue-in-cheek categories which include 'Jam in the Public Eye' for celebs and 'people of high office e.g. MPs and archbishops', 'Man Made Jam' (for men) and Children’s Jam. And then there’s a return of the National Trust’s Chutfest, a two day event at Barrington Court in Somerset on October 2nd and 3rd where jam and chutney makers can swop their produce - and others can buy it. Their categories are rather more conventional though the idea of one devoted specifically to rhubarb and ginger chutney has an endearingly eccentric ring to it. What I like about both these enterprises is the element of self-help - the barter and the swapping. Something that's always gone on in the country on an informal basis but which can benefit us townies too. Do you make your own jams and chutneys or do you let your produce go to rot? I have to confess we lived for years in a house with several apple trees and never managed to eat our way through them all. Much to the disapproval of my mum who patiently used to wrap them in newspaper and store them in the garage whenever she came to stay - often to find them rotting away several months later. I still feel guilty when I think of it. I don’t know why risotto is thought of as special occasion food. I suppose because it seems complicated to make if you’re unfamiliar with it but it is frugal food par excellence - and comforting at that. Sure, the rice is more expensive than most but you don’t need a lot of it. It also pays to use good parmesan (below) which I get from my local deli for no more than you’d pay in a supermarket (£16.95 a kilo). Don't buy ready grated - it's more expensive and the flavour isn't nearly as good. Saffron is expensive, I grant you, but you only need a pinch and if you buy it by the box from a deli or online from a supplier like this you’ll have enough for a couple of years. 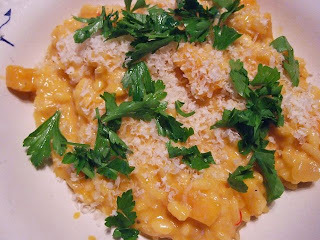 Risotto is also a great way to use butternut squash - or pumpkin come to that - a vegetable with which I have a bit of a love-hate relationship. It always needs something bitter or spicy to counteract its excessive sweetness. Sometimes I sprinkle it with crushed chillies and coriander before I roast it or sprinkle it with crisp-fried sage leaves but this time I used saffron because that’s what I happened to have. A lot of recipes call for mascarpone but that seems to me too rich - and just another expense. I used a dollop of the crème fraîche I had in the fridge and it tasted fine as would a little double cream though you’d probably need to correct its extra creaminess with a squeeze of lemon. Chopped parsley to serve if you have some. Wipe the squash clean and cut it lengthways into quarters - or, if using half a squash, in half. 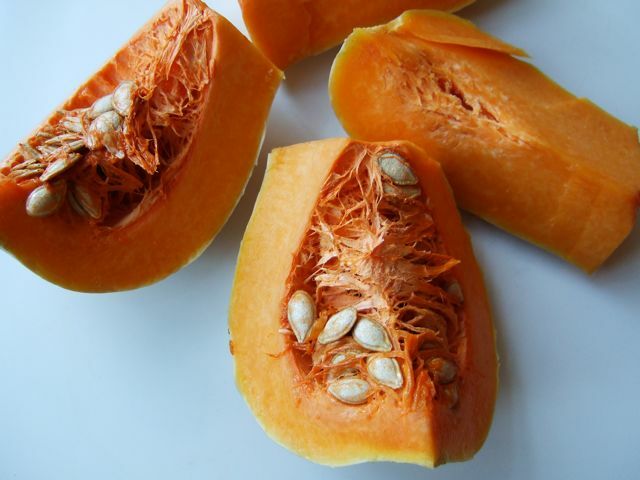 Scoop out the seeds then cut each piece across into 4 or 5 big chunks. Cut the skin off each chunk. Preheat your oven to 200°C/Gas 6. Pour 2 tbsp of the oil into a roasting dish. Turn the chunks of squash in the oil, season with salt and pepper and roast for about 15-20 minutes until almost cooked. Take out about a quarter of the squash, turn over the remaining chunks and give them another 10 minutes or so until completely soft. Set aside. Heat the stock and pour over the saffron then leave in a warm place to infuse. Once the onion is soft add the garlic and pimenton, stir then turn the heat up slightly and tip in the rice. Cook it for about three minutes stirring continually so it doesn’t catch on the bottom of the pan. Pour in the wine and when the sizzling has died down and it has evaporated add the fully roasted squash and give a good stir. Bring the stock up to boiling point and add a cupful. Stir until the stock has been absorbed then add more stock and repeat until the rice is creamy but still has some ‘bite’ and most of the stock has been absorbed (about 20 minutes). Check the seasoning adding more salt and pepper to taste and a little more stock or boiling water if the risotto has got too thick and spoon into warm bowls. Sprinkle with parmesan cheese and a scattering of chopped parsley if you have some. Do you make risotto regularly and if so what flavours do you like best? 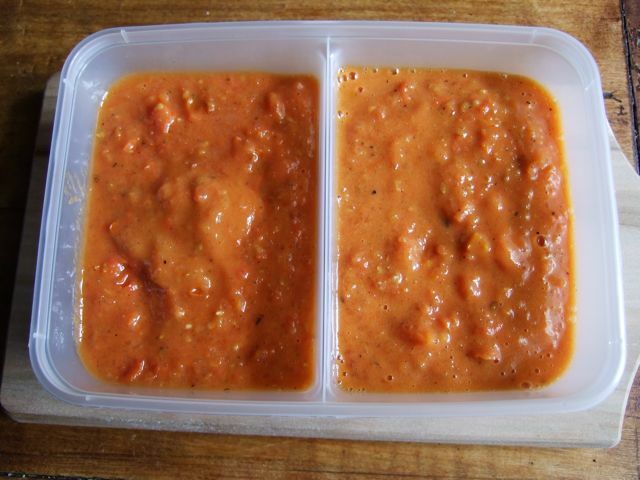 Having had four kids of my own I could identify with that so I thought it would be good if I could come up with a couple of recipes that wouldn’t break the bank, both made from the same set of ingredients. 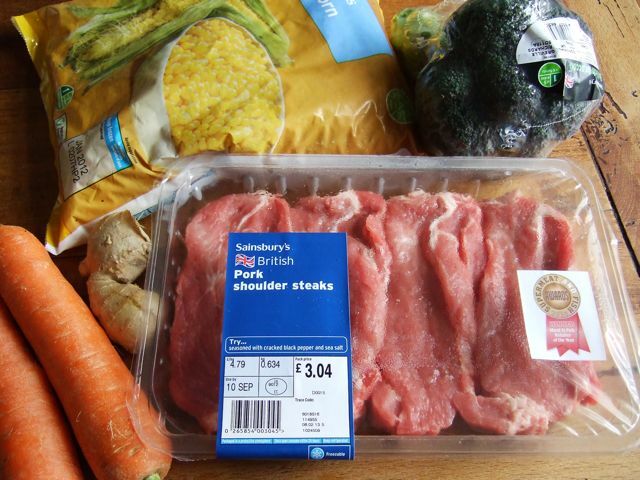 I headed for Sainsbury’s and picked up a pack of British pork shoulder steaks (£3.04 for 600g), a couple of large carrots (27p - cheaper loose than buying them by the bag), a head of broccoli (on special offer at 47p) and a 1 kilo bag of frozen sweetcorn (£1.19). Sadly at a time when sweetcorn is bang in season it was far cheaper buying it that way than on the cob (the cheapest fresh corn was £1.50 for four ‘cobettes’ - i.e. half sized cobs.) I also got a 55g chunk of fresh ginger (26p) of which I used about a quarter and put the rest in the freezer. 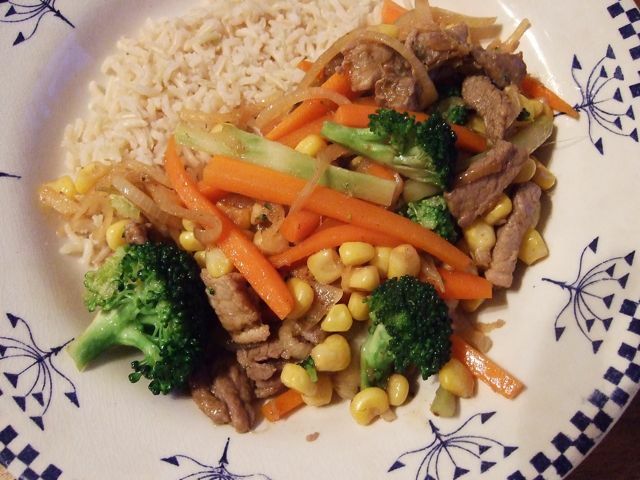 The first meal I made was a stir-fry, which is generally popular with teens. The advantage of them is that they cook quickly and use very little meat. I used about a third of the pork which could easily be replaced with Quorn for a teen who was having an 'off meat' day. We had it with rice but you could serve it with egg noodles for rice-haters. I’d actually like a bit of chopped chilli with it but it’s better to underseason dishes for kids and serve with spicy sauces for those who want more oomph. Cut the pork or chicken into fine strips. Put it in a bowl with the grated ginger, crushed garlic and soy sauce, mix well and leave it while you prepare the other ingredients. Finely slice the onion, cut the carrots into thin strips, cut the broccoli into small florets and peel the stalk and cut into fine strips. (Broccoli stalks are great for stir-fries). Heat the oil in a wok or large frying pan and stir-fry the pork for a minute until lightly coloured. Set aside, add a little more oil and fry the onion for a minute or so, then add the carrot, fry for another minute, then the broccoli - another minute - then the corn. Add back the pork and carry on stir-frying until the veg are tender, adding a splash of water if the stir-fry starts to catch. Serve with rice, soy sauce and sweet chilli sauce for those who want it. Again, not the world’s most inventive title. Doesn’t need to be. Don’t mention the mustard! 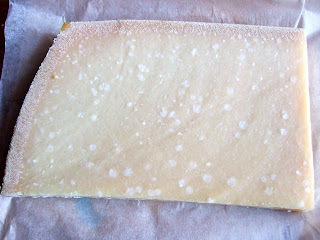 Trim any excess fat off the meat, cut into cubes and season with salt and pepper. Heat a frying pan, add the oil then add half the butter. Once it stops foaming add the pork and fry until lightly browned on all sides. Transfer to a casserole. Add a spot more oil and fry the sliced onion and carrot for about 5-6 minutes until beginning to soften. Sprinkle over the thyme, if using, and stir in the flour then add the stock and bring to the boil. Pour over the pork, bring back to simmering point, cover then leave over a low heat for about 30-40 minutes until the pork is tender. Meanwhile microwave or steam the broccoli until just cooked. Pour boiling water over the corn to thaw, drain and toss in the remaining butter. When the pork is cooked take the casserole off the heat and add the mustard and crème fraiche or cream and squeeze of lemon if you think it needs it. Add a little water if the sauce is too thick. 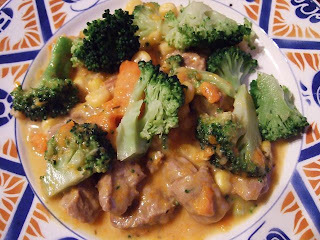 Add half the broccoli and corn leaving a little to spoon round the casserole and heat the meat gently without boiling. Serve with new or baked potatoes and the rest of the veg. So there we are - two good hearty meals for just over £4 (I’d forgotten how filling sweetcorn was) and hopefully two happy teens. Let me know how it goes notsupermum! Anyone else want to set me a frugal recipe challenge? Just write to me at the address on my profile telling me what you like and dislike . . . This really is the best time of the year for fresh produce. Almost too good. Temptation lurks round every corner as I found to my cost when I bought an insane amount at a veg stall in the lovely old-fashioned town of Wells the other day. But the bargains! 6 peppers, 8 apples and 1 1/2 kilos of courgettes for a pound each. Massive trays of plums and, best of all, a 4 kilo tray of tomatoes for £2. 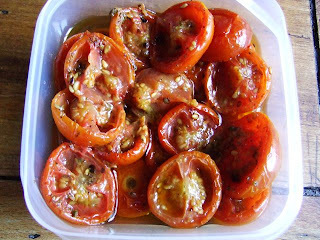 Although we've been munching heroically through healthgiving quantities of veggies since Saturday - much to the disgust of my OH who thinks 1 a day is excessive, never mind 5 - it's the tomatoes that have been the greatest success. Not that they were brilliant in quality. I started off using 500g odd for a ratatouille (you can find the recipe I used on my student website Beyond Baked Beans here) but they were really too small and too unripe to peel easily, thus scotching my initial plan to stash tubfuls of fresh tomato purée in the freezer. 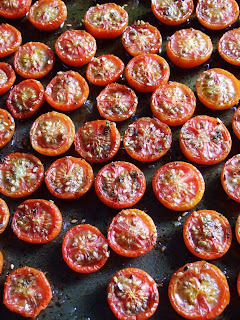 Instead I cut them in half horizontally, laid them out on a well-oiled baking tray, seasoned them with salt, pepper and za'atar and drizzled them with more olive oil. I started them off at the top of the AGA then transferred them to the cool oven for about 3 hours. They came out wonderfully sweet, just like those posh 'Sunblush' ones you buy in cartons. You can obviously just cook them in a low oven if you don't have an AGA. I blitzed half into a sauce in the food processor and froze that then drizzled more oil over the other half and put them in the fridge. We've been having them bruschetta-style on sourdough toast and they've been delicious but I've found myself thinking of making them into a salad with dressed lentils and parsley, and crumbling some feta on top. I think that's what I'm going to do with the next batch. I have to say it was all unbelievably satisfying and I felt ridiculously smug at my domestic goddessery. But I still have to finish the rest of my box otherwise my 'bargains' won't be as brilliant as they seemed. 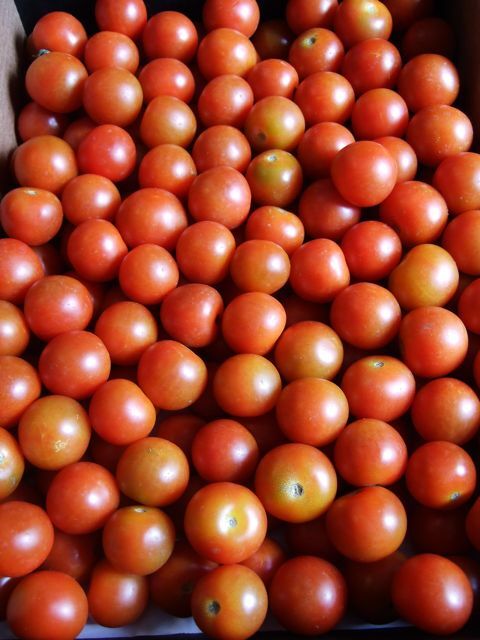 Have you been cooking up any seasonal produce like tomatoes in bulk? Or pickling or preserving? Do share any good tips.